Passengers who took the train between Ogaki and Ikeno in Japan on September 10, were in very special company. They were greeted on the train by rescue cats that have given a second chance at life. Some of the passengers mingled with the felines while others enjoyed their lunch. All the cats on board were due to be put down, but thankfully were saved by the rescue cat café chain, Sanctuary. 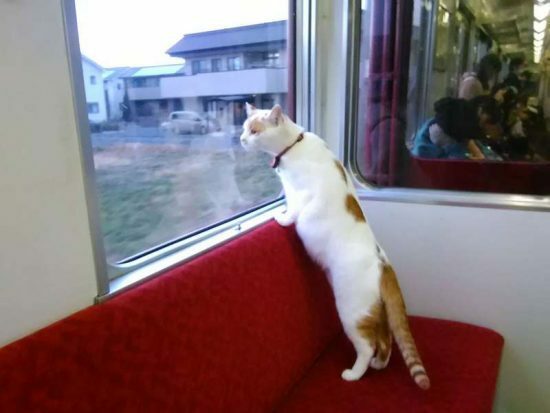 The rescue group announced in August that it had teamed up with Yoro Railway to create the world’s first cat-themed train café. The cafe was open for one day only and passenger capacity was limited to 40 people for each Cat Cafe Train. They began taking reservations on August 7 and all tickets were sold out in one day. Along with their ticket, passengers were given a boxed lunch and some sweets. Part of the proceeds from ticket sales will be donated to support Sanctuary’s rescue cat operations. The aim of The Cat Train Café was to raise awareness of the problem of stray cats in Japan, and the huge volume of those culled when they’re unable to be housed. Let’s hope that it has done it’s job – sadly, in 2016, 45,574 cat were culled in Japan. Click here to find out about a Japanese island that is overrun with cats!